Respect yourself. Love yourself. 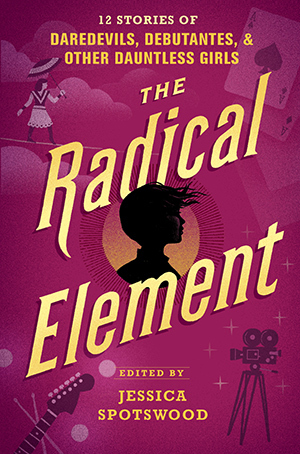 As radical a decision for an American girl to make today as it was in 1927, as radical for a student as for a spy, for a printer’s apprentice or a poker player. It’s a radical decision when you’re balancing on the tightrope of being a second-generation immigrant, of neurodivergence, of facing down American racism while loving America. It’s the only decision when you’ve weighed society’s expectations and found them wanting. With respect and love, twelve of the most talented writers working in young adult literature today —an impressive sisterhood that includes Marieke Nijkamp, Meg Medina, and Anna-Marie McLemore — have created a century and a half of heroines on the margins and in the intersections, young women of all colors and creeds standing up for themselves and their beliefs. They are ignoring their mothers’ well meant advice and forging their own paths — whether secretly learning Hebrew in early Savannah, using the family magic to pass as white in 1920s Hollywood, or singing in a feminist punk band in 1980s Boston. And they’re asking you to join them. /// This anthology follow-up to A Tyranny of Petticoats combines fact, fiction, and fantasy to tell stories about young women throughout history whose voices have been ignored for too long. Edited by Jessica Spotswood, with contributions from: Dahlia Adler, Erin Bowman, Dhonielle Clayton, Sara Farizan, Mackenzi Lee, Stacey Lee, Anna-Marie McLemore, Meg Medina, Marieke Nijkamp, Megan Shepherd, and Sarvenaz Tash. ⭐️ These are tales across time and cultures, offering diverse women as witnesses to historical times...A needed collection to broaden understanding of the many different faces of history. This [collection] has an admirable goal, and there is plenty to love. This collection is extremely informative, intersectional, and inspirational, and will be sure to spark dialogue.